Broxi is an adorable boy, quite shy but becoming more confident as he gets used to the kennel routine. He kennels very happily with his sister Keira and likes to keep the kennel clean. He loves a treat and takes them very gently. He stands quietly to get his lead on and is very easy to walk alongside his sister. Along with his sister he has the cutest ears in the kennel! 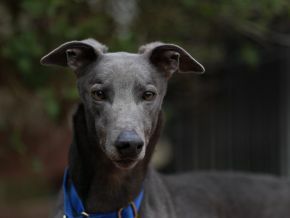 Ideally he will be rehomed with his sister and together they will make very loving and rewarding pets.